Mahony Hall at the Dublin venue, The Helix, equipped with STM M28 modular line arrays and N-12 stage monitors for TV talent show. 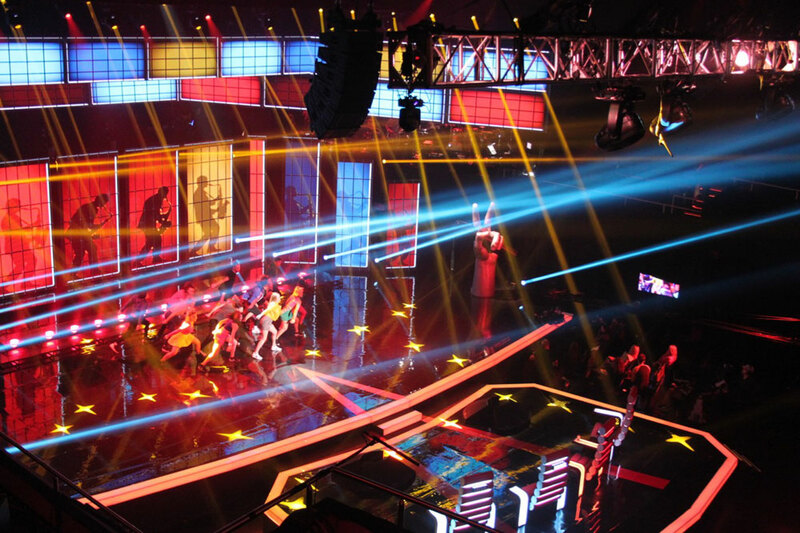 Rental company Sound Design has purchased NEXO’s STM M28 modular line arrays for Ireland’s edition of the TV talent show, ‘The Voice’, which is produced in the Mahony Hall at the Dublin venue The Helix. This is Sound Design’s fifth consecutive year of providing sound reinforcement for the live shows, keeping things fresh by changing the auditorium PA from the NEXO GEO S8 compact line array to the more powerful M28 cabinets. However, NEXO’s distinctive wedge-shaped 45°N-12 stage monitors remain in place, having become an integral part of the show’s design. Two circles, each formed out of 6x monitors, positioned in front of the famous red chairs to provide stereo monitoring mixes for the judges and dancers, are now a visual signature of the Irish version of the show. Flown high over the stage, two arrays each with 6x STM M28 cabinets provide the main PA, with 3x RS15 subs hidden on each side of the theatre. Trimmed at just over 10 meters, the compact STM double 8-inch modules supply coverage for 800 seats. Mixing the live shows himself, Vickers is using about 64 channels of his Soundcraft Vi6 digital console, handling 48 RF channels, including some 20 in-ear systems for the on-stage performers. ‘The Voice’ is broadcast by Ireland’s premier national channel, RTE One.